Only members in good standing of the ATF are eligible to enter ATF sanctioned tournaments. In good standing means that, if they are color belts, student black belts, Assistant Instructors, Trainee Instructors, or Certified Instructors, their organization membership must be current. If they are Certified Instructors, their certification must be current. A member in good standing must also be a member of and be training on a regular and consistent basis at an official ATF school or club and have his/her Instructor’s permission to attend and compete. Participants are not required to compete in all aspects of competition (including traditional Taekwondo forms, or one-steps/free-sparring). Instructors should encourage students in a positive manner to compete in all divisions they have been trained in; however, there might be times when a student is not prepared to compete in everything. An instructor should not force or intimidate students into something in which they are not confident. Competitors must wear the appropriate belt and compete in the division for the rank that they currently hold regardless of how long they have held that rank. A student should take pride in what they have earned and be honored to wear the correct belt. If a new Light Green belt is not comfortable with free sparring; he/she may choose to only compete in the forms portion of the competition. The size of rings for competition shall be square and should measure in the range of 12 –15 feet per side, depending on the space allotted. Each should be clearly marked, numbered, and have centering marks for free-sparring squaring off. As the competitors arrive at the ring, one of the judges should collect the registration cards. Once all the competitors have arrived, the judges should re-count the number of competitors and the number of registration cards to insure these numbers match. A judge will briefly explain the rules to the competitors before the division begins and will ask for and answer questions. During competition, judges must not show any prejudice regardless of the students’ school or region. They should base their score on the general form criteria, i.e., how well the student performs his/her form. The judges should not talk among themselves during or between forms. No discussions are allowed between judges during form competition. It is very important that the competitors be left with a positive impression and experience. Therefore, each judge should shake the hand of each competitor and congratulate them after the awarding of the trophies. All judges are responsible for areas surrounding their ring. In the interest of safety, the judges should make sure that spectators allow ample room around each ring for competition to progress unimpeded. This is based on the type of competition taking place. For rings in which free sparring is commencing, spectators should be aware that sparring competition can carry outside of the ring so adequate room is necessary. Judges should have competitors seated around the ring so spectators can have a better view. There will be no coaching from the sidelines by anyone including color belts, black belts, Instructors, family members or friends. This no-coaching rule is in effect between rounds as well as during rounds. Cheering and offering encouragement is indeed allowed and encouraged. Multiple Judges From the Same School: Each ATF ring has three judges, all three judges should be from different schools. In rare circumstances due to a limited supply qualified judges, two judges from the same school may judge a ring with approval from tournament directors only. Instructors Judging Students: Tournament directors should make every attempt to prevent instructors judging students, but often times this may be unavoidable. Instructors should use integrity when judging their own students and remember that for the purposes of the tournament that they are judges and not instructors. Instructors judge their students just like any other competitor. Instructors Judging Family Members: At no times shall instructors judge a member of their immediate family. In rare circumstances, exceptions may be granted by tournament directors. The center judge has authority over all competitors in his/her assigned division. That judge’s main duty is to see that each competitor abides by the tournament rules. The center judge conducts form competition first, and then one-step or free-sparring competition. The center judge will also instruct judges to recognize small differences in form technique by students from different schools and regions as natural and to be expected. He/she may award points; warn a competitor when there has been a rule infraction and may award penalty points for the rule violations. He/she also has the power to disqualify a competitor when there has been an infraction. Each of these actions hinges on the appropriate verification from the appointed corner judges and authority granted by the position and these rules. When the winner of a one-step or free-sparring match is announced, the center judge will hold up the winner’s hand to complete the match. At the end of all competition for that division, winners will be announced and awards given. As soon as a division is assigned to a ring and the center judge has the proper paperwork, he/she should start the competition immediately. Assign a corner judge to perform a short warm-up with the competitors. By completing competition as quickly as possible, competitors will appreciate your efficiency and you will spend less time judging. The center judge is responsible for controlling his/her individual ring during competition (in the way a chairman heads a committee meeting). All judges have equal authority to call points or penalties. A center judge cannot overrule a call by a corner judge, except through his own vote on a point or warning which has no more weight than each of the other two judges’ votes. No judge is allowed to alter, add, or modify any ATF rules. The definitions of a point, penalty or disqualification are explained in the ATF Tournament Rules. It is the responsibility of the center judge to know and fully understand the complete ATF rules. It is the responsibility of the center judge to see that results are taken to the tournament officials’ table. All results turned in to the tournament officials’ table must be completed entirely, correctly, and legibly. All blanks must be filled in on the envelope and score sheets. The judges should print their names on the result sheets in the appropriate areas. All registration cards should be placed in the envelope and turned in with the score sheets. The school owner’s name and the city/state where that student trains must be written on the score sheet. If the paperwork is not complete, tournament staff and officials will not accept it. All judges must remain in their ring until they have been relieved by another authorized judge or dismissed by the appropriate tournament official(s). Unless a senior instructor has been appointed as a tournament arbitrator by the tournament committee or called upon for safety reasons, any instructor should not interfere in the competition. This includes division break-downs, pairings, point calling, etc. It is understandable that an Instructor would want to “protect” their student from what they may consider improprieties. However, that Instructor is not justified in confronting the judges assigned to that division. This type of action embarrasses the judges, competitors, other Instructors, and often times even the spectators causing embarrassment to the ATF as a whole. If the instructor feels there is a problem, that person should notify the Tournament Committee Representative with the concern. The Tournament Committee Representative will decide if any changes should occur. Junior (rank) instructors are under a lot of pressure trying to do the best job they can with as few mistakes as possible. The presence of a senior instructor at ringside is intimidating and seems to create more pressure for the junior instructor. Although it is not the intention of senior instructors to create this type of situation, it does happen. Division breakdowns are handled by the ATF Tournament Committee. The divisions will be made according to the number of competitors in each of the age and rank groups. 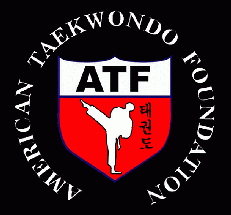 Also, all black belt rings will be setup according to the ATF National Championship Divisions. All competitors are encouraged to pre-register for any tournament with their Instructor or school/club owner and to arrive at the tournament site prior to competition. If for some unforeseen legitimate reason, a competitor is late for his/her division, the center judge may allow the competitor to enter the division. If the forms competition has not been completed, a late entry may be allowed to enter the competition. If the first round of one-steps or sparring competition has started, no late entries are allowed as a late entry would disrupt the bye system.